It is approaching the festive season and still no snow of any note. There was a light dusting over the tops at Wasdale last week as you can see in the header image but nothing really to get excited about. As I have mentioned before, whilst I love the snow I do not enjoy driving in it. I am now approaching the 7th anniversary of my 'big bump' in Eskdale and every time I go past the drystone wall that I demolished, I shudder. So lucky that I didn't suffer any injuries. The past few weeks have been spent writing for FUJIFILM, running workshops and judging competitions. There are also a few other plans being put into place but I will tell you more of those when the time is right. It is always a pleasure to be asked to judge competitions and I was particularly honoured when asked to be one of the four selected for Trail Mags 'Mountain Photograph Of The Year.' I can honestly say that when I saw the shortlisted images I was blown away by the quality and it provided me with a very difficult choice as all were capable of winning. I spent days deliberating, whittling down and going back to them. I have despatched my selection off to 'Trail Towers' and I understand that the results will be announced in late December. I must add a huge congratulations to all who took part and those who were shortlisted were the best of an excellent bunch. FUJIFILM also asked me to judge their 'DIFFERENT VIEW' competition and again what a nice headache that caused me. They will announce the result shortly. On top of that, LEE FILTERS have asked me to be the assessor for the December batch of images that people send in for assessment. Looking forward to receiving those and they will be live in late January. My trips out have mainly been up to Wasdale and I was lucky enough to catch a vivid orange sunrise as I crossed Birker Fell. A bit of snow on the tops added to the atmosphere as the Scafells occasionally peeped through the clouds that kissed the top of them. I am sometimes asked as to which coloured filters I use but I have never owned any coloured filters or gels. What you see is what you get and I never mess around with saturation or luminosity. For me it has to be real. No fiddling and changing from reality. The workshops have been great fun again. I have to say that I am lucky in that I have never met anyone who hasn't become a friend afterwards. Great people and a pleasure to be with. Always honoured that they select me to take them out. 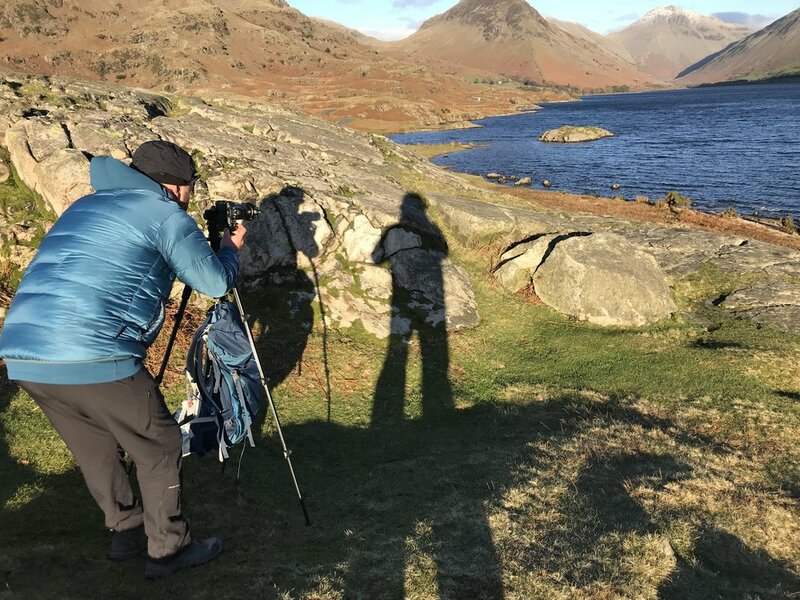 The first was with Tim who was about to undergo a vocational change of life and become a Minister of the cloth and we had a cracking day around Wast Water. The air was a bit cool to say the least but we expect that as it is the back end of the year now. Having said that, I have worn that hat in June and July this year! He produced a couple of wonderful images and was delighted with the day. Just this week I have returned from a few days on the fells with Karl who is about to go up Kilimanjaro and wanted to be in control of his camera on this once in a lifetime trip. Having got an understanding of his camera it was time for Karl to get to grips with it literally as he will be ascending Kilimanjaro with little time for setting up tripods. The weather around Wast Water was very clear for the two days. Freezing but clear with an icy wind and I was pleased with the time he took to write me a testimonial so quickly.